Labeling can be a lifesaver when you are a Kindergarten teacher or parent that doesn't want items to be misplaced. We love this Epson LW-600P label maker because it is easy to use and offers versatility in that you can print on different mediums to make labels for cubbies, bins, folders, and even iron-on labels for clothing by simply swapping out the type of cartridge that you are using. 1. Label cubbies or bins using a good quality label maker. As mentioned above, we use the Epson LW-600P label maker to print labels for cubbies. A simple black-and-white label suffices, but you can also add images if you want to group children in some way such as morning, afternoon, or all-day students. 2. Provide parents with plastic storage bags that should contain one change of clothing. Accidents will happen, so encourage parents to provide a change of clothing. It's easy to store the clothing in a plastic storage bag that you label with their name. You can write it with a marker or easily print a label and stick it on the bag. 3. Provide parents with Iron-On Clothing Labels for extra clothing. No one wants to lose clothing, but with a dozen children that all wear the same size, it can happen. It's really easy to print iron-on labels using the Epson LW-600P label maker. Print customized iron-on labels for parents to use on their children's clothing. You can also use the iron-on labels to label school-owned clothing that is supposed to be returned. 4. Create and label a file folder for each child that documents parent meetings. If your school doesn't already require this, you should consider doing this so that you are able to remember parent conversations. Again, the Epson LW-600P is versatile in that you can print customized labels to stick to folders. If children have allergies, it is helpful to label bins or shelves in your snack area so that everyone is able to quickly and easily see who has allergies. If you are absent, you want a substitute to be aware of the snacks that are special for anyone with allergies. Epson has also launched a developers’ program for the World’s first App enabled label printer. Developers can access the LW-600P SDK and open APIs and very easily create personalized printing solutions with the LabelWorks LW-600P." It only took us 20 minutes to figure out how to pull this out of the box, add batteries, add the cartridge, download the software, and start printing. Now that it's set up, we can print customized labels in just a few minutes. 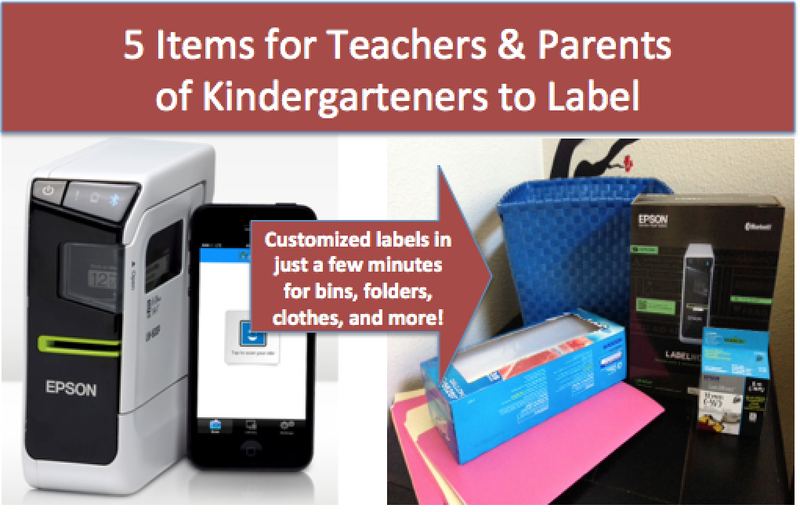 This technology is a must-have for teachers that want to easily print customized labels for numerous children and purposes in the classroom. Thanks to Epson for the complementary label maker that they provided. All opinions are our own and yours may differ. I like the idea of iron on labels. It's really smart to label for am and pm sections. I've never seen a label maker this nice before. It definitely beats my old hand held one. Great for organizing.